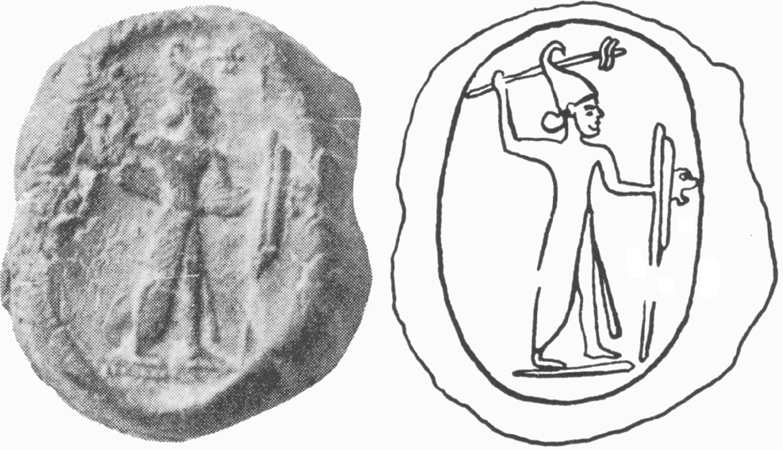 These are figures alone or in groups, other than those with lions or seated before an incense-burner. On the type, Culican, AJBA 1 (1968) 100-103; 'no ordinary soldier'. 16/3 Ibiza no. 63 (Ibiza 4774). Very worn; as the last? 16/5 Sternberg, Aukt. 26 (1992) no. 518; 22 (1989) no. 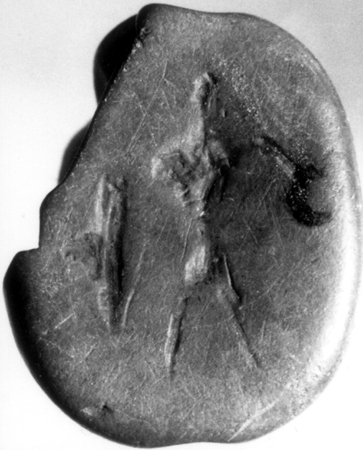 473; Syria 76 (1999) 268, fig. 53. BH. 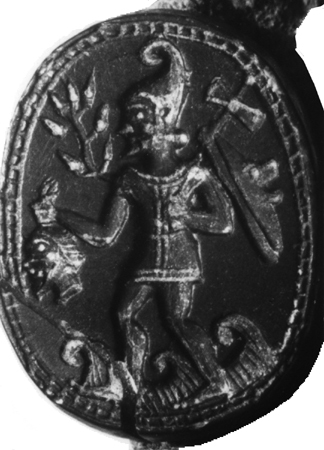 Man with helmet with forward crest, patterned tunic and skirt, holding a shield with lion-head boss and spear, and an axe in lowered hand. 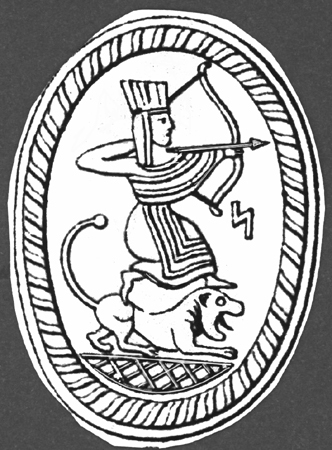 Drawing a bow, wearing a long skirt, and standing over a lion. 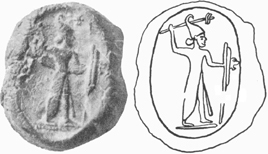 The type of crown is not clear, but not, it seems, Achaemenid. 16/6 Spano Coll., from Tharros. Marmora, pl. B 82. BH;EXnb. A letter in front. 16/7 Munich no. 221, pl. 24, from Sardinia. Zazoff, pl. 22.1. As the last. 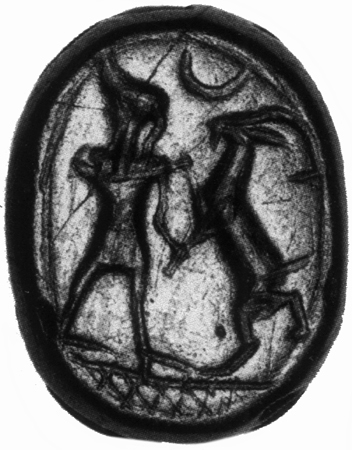 All have short dress and seem not particularly regal, but the goat as adversary appears in monumental near eastern and Persian art. 16/10 Cambridge. Iraq 21 (1959) pl. 11.75. BH. VID. 16/X1 Nicosia, from Kition. Kition II, no. 505; RSJ 8 (1980) pl. 2.3-4 (Gubel); Reyes, no. 180. Lapis lazuli. BL. 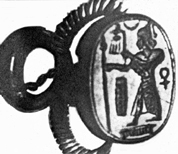 Shoulders axe and holds palm sceptre; Disc-and-crescent above. Long dress, no headdress. 16/X2 Boston 98.712, from Cyprus. AG pl. 61.11; RSF 4 (1976) pl. 9.2 (Culican). Green glass or plasma?. EXCR; in gold mount. 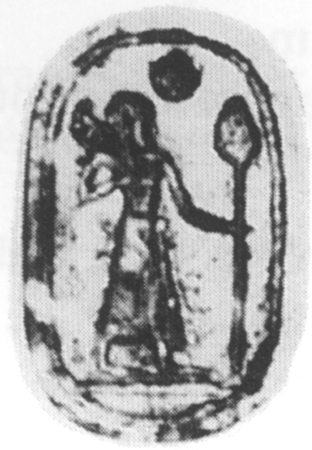 Stands holding sceptre and shouldering axe, long dress. 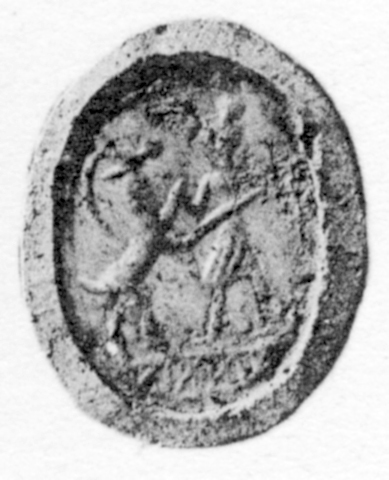 16/X3 Jerusalem IAA 73-203 (once Lefkowitz). Clay bulla from Akko. AJBA 1 (1968) 97, pl. 5B (Culican); CSAPI no. 5. 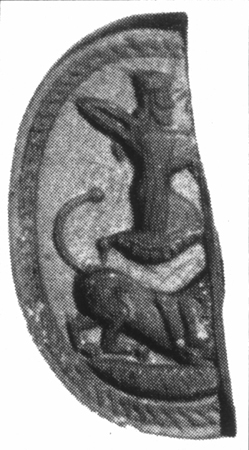 Stands holding spear and shield with lion-head boss, with battle axe raised, wearing long dress and cape. 16/X4 Karthago II, pl. 7c. Clay bulla. BH;EXnb. Riding a horse, shouldering an axe. 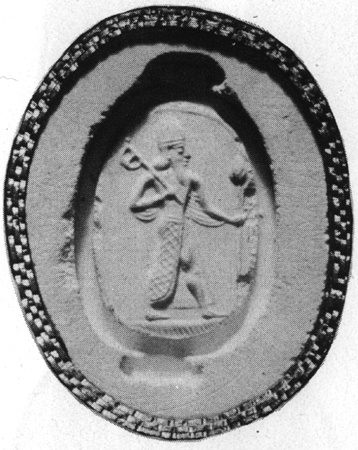 The fine border and deep exergue suggests this might be from a metal intaglio, but there was a mount, so perhaps just a hard stone, well cut.